This episode introduces Micah Torrance, a former lawman turned alcoholic. 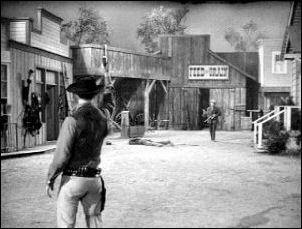 One day I was headed for the saloon for a nice cold beer when a drunk stumbled out. He was so drunk that he couldn’t put one foot in front of the other, and I watched him fall over flat on his face. My heart immediately went out to him. I bent over to help him up. I asked him if he needed help, and he told me he just needed another drink. I offered to buy him a cup of coffee. “Coffee,” he moaned sarcastically, then he passed out. Well, Fred walked up about this time and asked me who it was. I told him that it was just some old bum. He studied the man closely. “No. No, that’s not just some other old bum, Lucas. That’s Micah Torrance. Not much left. 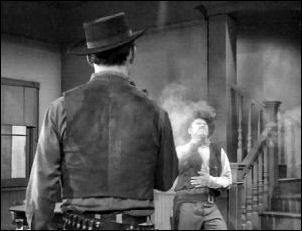 But when I knew him, he was the finest peace officer on the board.” I handed Fred my rifle and helped Micah to his feet. We carried him over to the jail to let him sleep it off. This man needed to see things for the way they really are. “No you won’t you’re a drunk,” I stated, never one to mince words. “I wouldn’t give you a dime for a drink, but I’ll give you a job.” But still, this man was feeling sorry for himself, thinking he was useless. He was another one that needed his faith in himself restored. “Doing what, swatting flies?” Micah said pitifully. Micah stood up and stated, “Mr. McCain, you got yourself a hand. One of ‘em anyway.” He had told us earlier that he had been shot in the arm and the nerve had been damaged, leaving it useless. I couldn’t help but to think that some of that was in his head – not his hand. Meanwhile, my boy Mark was at home cleaning the floors. It wasn’t one of his favorite things to do and he always complained when having to do it. Today was no different. As we walked into the house, I smiled as he looked disgustingly at the mop he was squeezing out. “It’s women’s work. And I don’t cotton to it!” he declared. I introduced him to Micah and told him he’d be helping us build a corral. They shook hands and something in their eyes sparkled. They took an instant liking too each other, which was good. He needed the influence of a young boy to encourage him. Micah told me he’d sleep in the barn, regardless of my invitation for him to sleep inside with us. “Later,” he stated. “For the next for nights, I’m companion to owls and brother of the dragons,” he told me. “You know what it means.” I did, but Mark didn’t. I’m sure he’d ask me about that later! It didn’t take long for Micah to realize that it would be harder than he thought. He was working on the corral when things got really rough and he found himself needing a drink. Mark had a soft heart and didn’t really understand why Micah was so sick. I knew that hard work was the best thing to help him get through the withdrawal. Mark felt sorry for him and went to offer to help. I had to be stern with both of them. “Do your own work, Mark.” I ordered harshly. Mark gave me a dirty look, thinking I was being mean. I know it was hard for a ten year old boy to understand these things. That night at supper, Micah was having even more trouble. He needed a drink really bad. "I've got visitors Lucas," said Micah. Mark of course didn’t understand this. "I don't see nobody," said Mark. "Just the case of the whips and jingles. I better be getting back to town," said Micah. Mark asked what was the whips and jingles. Micah told him that he had a big one right on his shoulder. "Oh Animals of a sort. They come in various shapes and sizes.....pretty big usually." Now you wouldn't know it, but I got a big one sittin' on my shoulder right now." “Saddle me a horse, Lucas,” Micah begged. I told him no. “I can’t do it, I tell ya'! I’ve got to leave!” Micah declared. I wasn’t going to let him give up that easily. I knew he could do it. “Then start walking. You oughta make to town by sun up.” I didn’t look at Mark, but I could tell he was upset with me, not understanding why I was being so tough with him. Micah got up and walked out the door, but I knew he wouldn’t get far. I knew he had to figure this out for himself. Mark thought about this for a second, then he said, “Whisky, ya' mean.” I nodded. “I know just how he feels!” Mark suddenly declared. “It sure did. Taught Arch too. He got sick just watching me,” Mark laughed. I guess that I didn’t need to go into any lectures at this point then. Micah walked back in then and announced to me that he was useless. Again, I ignored him. Mark finally decided to adopt my idea of tough love. “Whisky make you work better?” Mark asked. I was a little shock, but pleased with my boy. “Supper will.” I knew that Micah’s self-pity was doomed for sure now! While we were at home eating supper, three men walked into the hotel. No one knew it at the time, but they were there to perform an event that would change North Fork for all times! The men walked into the hotel and declared that they wanted a room. 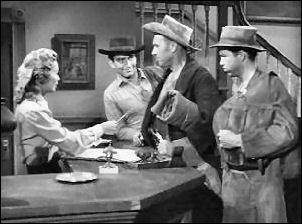 Nancy Moore, the desk clerk, asked the two brothers to sign in. “We ain’t spelling men, Florry Shelton declared. “Just make your mark, boys,” the third man, Lloyd Carpenter suggested. So they did. Then Lloyd decided to turn on his charm with this pretty young lady. He took his time signing his name as he introduced himself. Nancy smiled at him and introduced herself as well. It was clear that he was interested in getting to know her better. “He’s too old for you, Nancy. Besides, you don’t know anything about him.” Fred, her uncle, declared from the chair in the lobby where he was reading his newspaper. “I’ve grown up, Uncle Fred,” Nancy reminded him. He didn’t argue too much, but reminded her that there was more to growing up than putting on a little weight. The Shelton brothers came back down the stairs and asked the marshal if he knew of anyone by the name of Micah Torrance hanging around. Being a bit too trusting of these visitors, he told him that Micah was out at my place. The brothers made their way to saloon to get drunk. It didn’t take long. 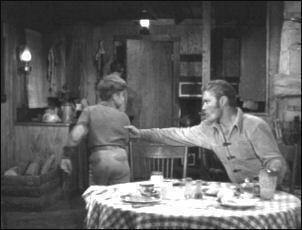 The two started roughhousing in the saloon and were making a big mess. Everyone ran out while they worked on wrecking the place. Fred walked in and told them to stop. Lloyd came in also, acting like he was on the marshal’s sided. “Now, what in heaven’s name do you boys think you’re doing? You oughta be ashamed of yourselves! Breaking up property, disturbing the peace like that!” he declared. Well, I guess the marshal had a soft heart because he allowed Lloyd to talk him into letting the boys pay for the damage and leave the saloon. If only the marshal had known the whole thing was a plot! The Shelton's told Lloyd that they would take care of Torrance the next day. Well, they stuck to their promise. The next morning, Micah was working on the corral when they showed up. “My my, how the might have fallen!” they declared. “We don’t hang easy,” they declared. Then they told Micah that they had come to finish him off. Mica h told them he no longer carried a gun, so they threw one to him. Little did the boys know that I was there ready for them. “Not today, boys!” I announced my presence. “Ride out. You’re trespassing.” They had heard about me and knew they didn’t want to go up against me. But before leaving, they promised Micah they would be back. I came up to Micah, a solemn look on my face. He knew what I was thinking. I had a small boy who would be endangered if he stayed here. Micah had grown to love and care for both of us since he arrived, so he understood. I apologized, because I wish he could stay. But no matter how much I’ve grown to care for this man, my son had to come first. “Stay the night?” I asked. I didn’t figure they’d be back today. These bad boys brewed up more trouble at the saloon that afternoon. They went back to the saloon “I think this is a puny no account saloon in a puny, no account town. Mr. Bartender, you have been paid! In advance!” they declared. Then they again began throwing things and shooting up the place. Lloyd walked in and asked the brothers if they had finished off Micah yet. They told him that they had met me, and Lloyd said that he’d heard talk around town about me. Marshal Thomlinson walked in then and told the Shelton brothers that they would be staying the night in jail tonight, and riding out of town tomorrow. Lloyd thought it was time to tell him who he really was. “Now don’t be hasty, Marshal. I plan on staying,” Lloyd declared. That’s when the problems really started. Fred tried to get all three of them in front of him, but Lloyd was blood-thirsty. He shot and killed my friend. Lloyd was tired of the Shelton’s antics. He hadn’t wanted to come here in the first place. He figured he’d have to take care of things himself and told the brothers that he would personally deliver me into town so they would be able to get to the Marshal by themselves. Lloyd came to the ranch and told me. I didn’t know who he was, but he told me the whole town was scared and needed me to come help get rid of these boys. Fred was my friend, and I didn’t like bad boys coming into town thinking they could take it over. After all, this is my boys town. So I agreed to go in with this stranger. Micah saw things more clear than me, though. He saw Mark crying and came into the barn to stop me from g oing. “You’re making a mistake,” Micah tried to warn me. Micah seemed really sure of himself. “Maybe you oughta come along,” I declared without turning from my horse. I quickly turned my head and looked at him. There was still doubt in his eyes. I wanted him to see my disappointment. He knew I was in danger, yet he still hesitated. “Stay here with Mark,” I declared. This upset Mark. Mark knew Micah should have gone in to help. “So, who are you to talk? You aren’t a marshal anymore! Who are you to tell my father what to do?” he declared boldly. Micah looked at him, knowing that he was right. Micah was being a fool too. So he hurried into the barn to get ready. Mark came to apologize. Micah was getting his shotgun ready and told Mark to saddle him a horse. He had to go in and do his duty. "Sorry Micah," said Mark. "What are those?" "Shotgun slugs boy. Carries three times as buckshot." "They came in handy once, maybe they will again," said Micah. "Now go get me a horse!" The town was eerily quiet as I walked in. Not a person was on the street. Not a sound could be heard. As I rode in, I was a bit skeptical about what exactly I was up against. Lloyd told me he’d go on ahead. I waited. I watched and listened. I listened for the least slightest noise. The noise was a rusty hinge squeaking on a door. I fired my shot. Boom! It killed Florry. Suddenly, I felt a shot hit me and I fell over in pain. Another shot hit me. I laid motionless on the ground. Andrew felt victorious. “Hey Florry, did you see? I got me that rifleman! Hey Lloyd, did you see? I got him! It was me, wasn’t it?” he declared. “Yeah. You got him,” Lloyd a nswered. Andrew ran to tell his brother. “And he got Florry.” Andrew went to find Florry and was saddened that he had died. Andrew took off his hat and said..... "Why Florry, you ugly old devil. You went & got yourself kilt." I started moving, and Lloyd asked Andrew if he wanted to kill me. Andrew did, of course. But as he stepped out to take care of me, a shot rang out. Boom! It was Micah. He had come to help after all! Now it was just the two of them – Micah and Lloyd. Lloyd was sure Micah didn’t have a chance. As he slowly aimed, Micah quickly shot him dead in one shot! It was over. Micah came to my aid. A look of pride came on my face. My boy was so grown up! He didn’t want anyone else to take care of me. Micah was beginning to realize just what kind of family he had hooked up with. “All right, son. But I’ll ride out every few days just to keep an eye on things,” Micah declared. “All right, Marshal.” Calling him Marshal brought smiles to all of our faces. I'm sure glad he added Micah! piddlin' stuff.....James Drury appeared in two episodes ― The Marshal as Lloyd Carpenter, he's the cowboy who shot & killed Marshal Thomlinson ― Death Trap as Spicer, the cowboy who wanted Stark dead. Warren Oates appeared in five episodes ― The Marshal as Andrew Shelton, he is the brother who took off his hat and said..... "Why Florry, you ugly old devil. You went & got yourself kilt" ― Bloodlines as Jud Malackie, he's the brother Micah knocked the gun out of his hand ― The Prodigal as Santos ― Miss Milly as Marty Ryan, the heavy of the two ― Day of Reckoning as Will Breen, he's the one wearing the derby. Warren Oates played a brother in three episodes - Bloodlines - The Marshal - Day of Reckoning. Robert J. Wilke appeared in six episodes ― The Marshal as Florry Sheldon, he was one of the Sheldon brothers who wanted to kill Micah ― The Pet as the heavy Haskins, the dude who killed Flecker. R.G. 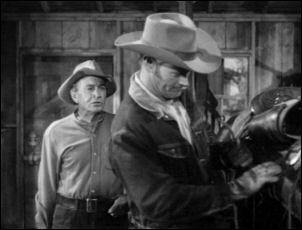 Armstrong played Sheriff/Marshal Fred Tomlinson in two episodes — The Sharpshooter and The Marshal. Abby Dalton as Nancy Moore. She was the niece of Marshal Fred Thomlinson and the clerk behind the desk at the hotel. 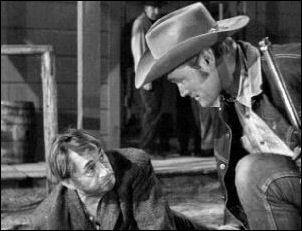 Bert Stevens was in four episodes ― The Marshal as the doctor ― The Babysitter as a Barfly ― None So Blind as one of the townsmen ― Panic as one of the townsmen that goes to Lucas' to help burn down the ranch. Did you ever wonder what happen to Nancy Moore? Where did she go, what did she do? Here is a great story based on this episode when Nancy returns to North Fork, it's called Saving Vernon by Michelle Palmer. What a great story, I know you will really enjoy this!